Since I was replacing the dashboard, it seemed like the ideal time to ;make the switch to LED lighting for my instruments. Since my Z has a red/black color scheme, I went with red LED backlighting. I replaced the stock incandescent backlighting bulbs with SuperBrightLeds BA9S red bulbs (6 LED High Power Bulb – BA9S-RHP6). For the blinkers, emergency brake light, high beams, I used the BA9S-x4-x-xV bulbs (of the proper color). They are DAMN BRIGHT. I will need to tone them down at night. 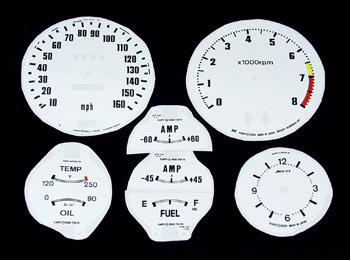 All the stock gauges have a green “bubble-type” plastic filter that needs to be removed first. Open the gauge, and with a razor trim the little bit of plastic that protrudes through the back of the gauge. Then just press out the filter from the back. To the right you can see the filters. This is the tach with the needle and face plate removed. Two more filters are laying on the desk above the tach. They pop out very easily. In this photo the blinkers are at the bottom. Get an LED color that matches any filter you have. If you want to keep the OEM green indicator bubble, then get a green LED. For the high beams, get blue, for the blinkers, green, for the e-brake, red. The same applies for the external lighting – front blinkers (amber) and brake lights (red). Really, only the reverse lights and dome light would be white. 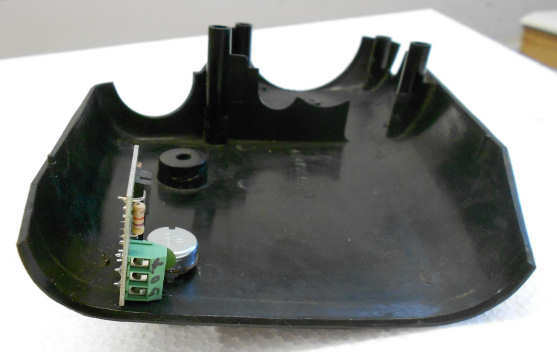 Instrument panel backlight bulb connectors – Side view (left), top view (right). Most of the sockets in the back of the instruments are a basic ‘one wire’ connection, where the barrel (outside) of the bulb is connected to the chassis for ground. However, several of the sockets have this reversed – assuming you have good visibility to the connector, these are easy to spot – they have two wires running to the bulb socket. These “two wire” bad boys have the polarity reversed and LED bulbs may not work without some tinkering. My experience with some LED bulbs is that they have a specific polarity: +12V to the end connector and ground (chassis) to the barrel. See LED Glovebox Light for specifics. I did go back and test one of the spare BA9S-x4-x-xV bulbs I had left over, and it was not polarity specific – it worked regardless of how I hooked it up – and this is good, and what I would expect from a quality design. Recommendation: Test your LED bulb polarity before you install them, just to be safe. 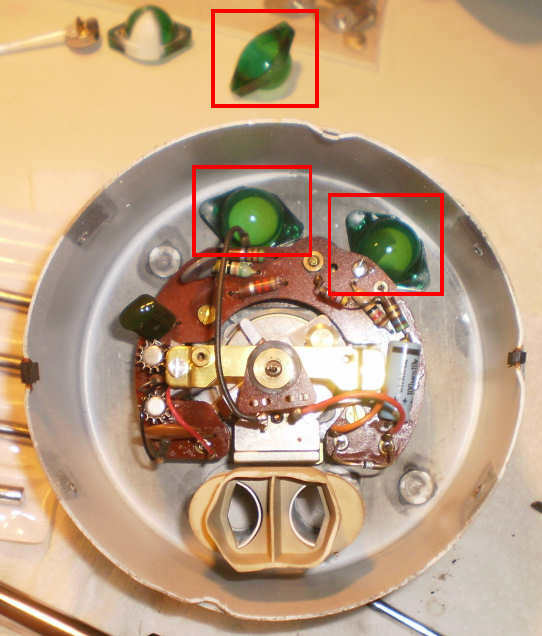 In the image below, the sockets on the left in both images are the ‘one wire’ version, and you can clearly see the little copper ‘spring tab’ that creates the ground connection to the back of the instrument. The socket on the right has two wires and no little spring tab to ground. Applying the new faces takes time, and care. You can remove the sticker once it’s on, but only one time, and then only if you don’t stick it down well. It helps to have a bright backlight when you are getting ready to stick down the faces – this will really improve your aim. Take your time, have a clean space, make sure there are no interruptions, perhaps even a glass of wine to mellow you a bit. 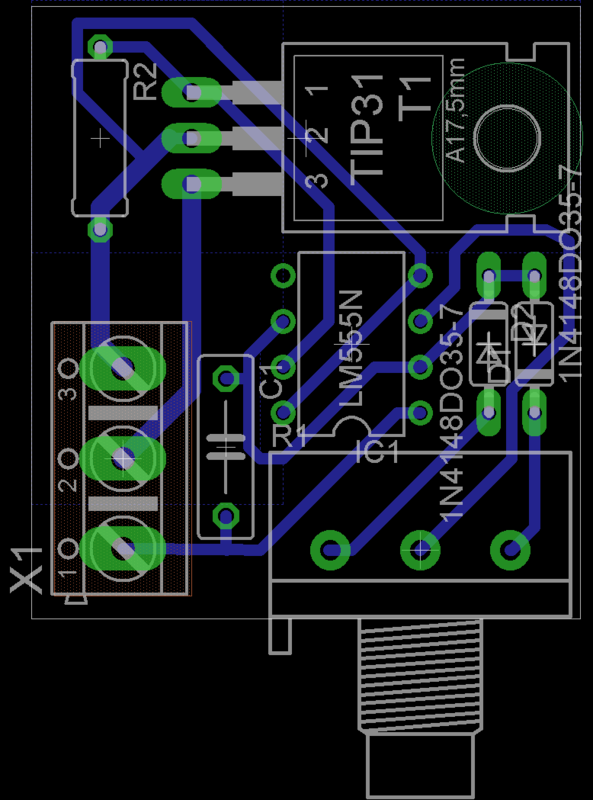 To pull off the indicator needles with no damage, I used a small tool that is also used to pull integrated circuits out of sockets. It has small fingers that go under the needle. This worked better than pliers without any damage. I used a ‘fire engine red’ nail polish to paint the tips of the needles red. A white needle against a white gauge face might not be so easy to see! 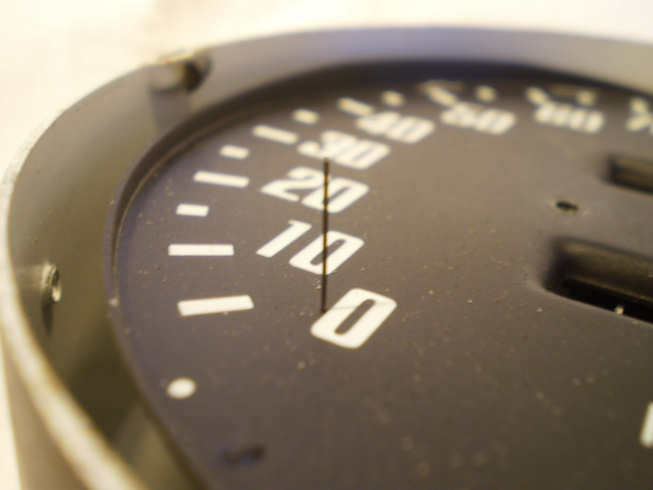 The speedo has a small ‘pin’ at the ‘zero’ that stops the needle. It needs to be held out of the way until the new label is on. It can be carefully pulled out and retained from the rear of the dial face. A small pin-hole in the new label face will allow this stop to poke thru in the proper place. 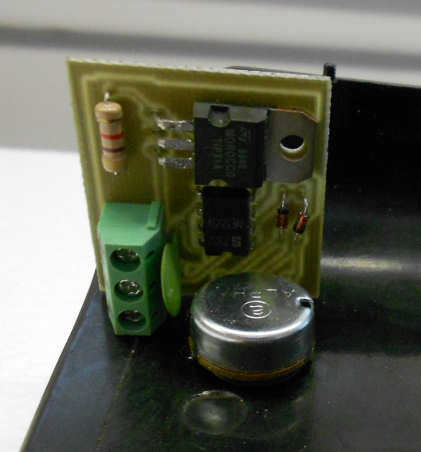 The final challenge – the stock rheostat that controls the brightness of the bulbs will not work since the LEDs draw so much less current than the original incandescent bulbs. With the stock dimmer rheostat, the LEDs were always on. 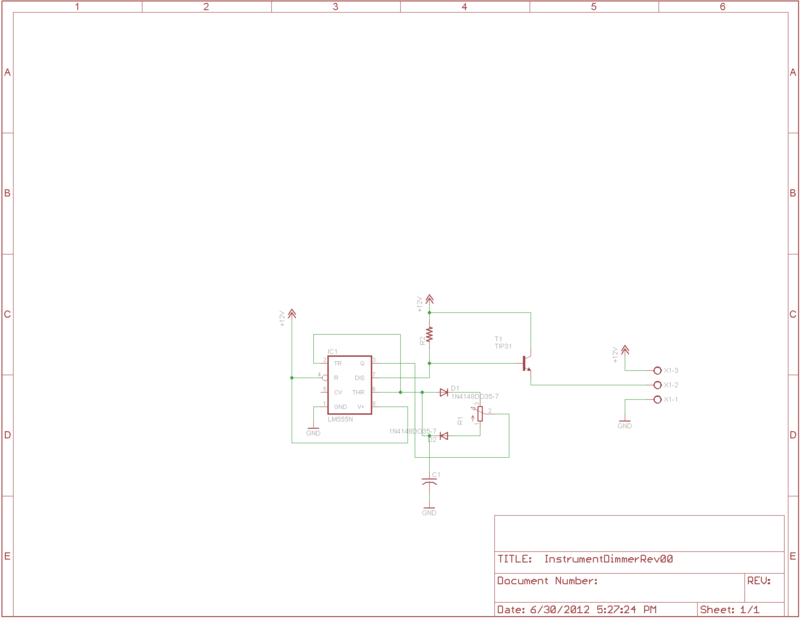 I made a small PWM (Pulse Width Modulation) controller based in the 555 timer IC with a power transistor to do the switching. 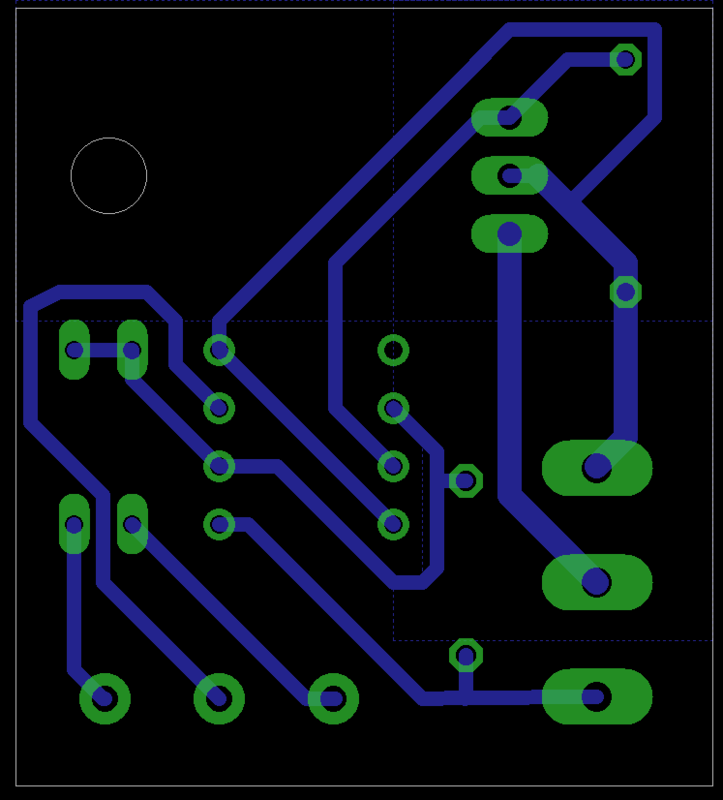 The board is soldered to the pot, which in turn provides the only mounting point. This all tucked neatly into the plastic cover around the steering wheel shaft, pretty close to the original dimmer location.